*Or, How to stop worrying and beat the recession. The results rolling in from the fundraising appeal were… well, terrible. It was mid-November, the economy was in shambles and getting worse by the day and Oxfam America’s first end-of-year email appeal of 2008 was tanking. Oxfam America, an international relief and development organization, has a loyal donor base, and for the last several years similar early-bird emails – sent to a limited group of supporters – had done well. This year, the appeal was generating 50% of last year’s total, even though the audience had grown by 50%. Clearly, the recession was having a dramatic affect on Oxfam’s fundraising. We were already into the last 45 days of the year – by far the most important period in the calendar for Oxfam’s fundraising – and we were in trouble. So we called a planning meeting and started answering the question, “What more can we do?” And in the end, by shifting our approach, adding a handful of new elements and tweaking our tactics on the fly, we were able to increase end-of-year giving by almost $200,000 over 2007, bring in over 3,500 more donations and beat our goals. Recession be damned. Like a lot of large, well-branded organizations, Oxfam America’s holiday appeals traditionally relied on a broad overview of the organization’s past successes and upcoming plans, reminding supporters why they care about Oxfam in the first place. That needed to change. After our disappointing first appeal, the online fundraising team met and decided that we would focus on just one major problem – the fact that 100 million more people went hungry in 2008 – and give that problem a name: the Global Hunger Epidemic. By focusing on this specific problem, we hoped to make case for why it was important to give right this minute, not just why Oxfam was a worthy organization in general. In addition to tweaking our messaging, we tweaked our tactics. First, we set a public goal of raising $2 million online by December 31st (a natural tax-year deadline) and promoted the goal in all email and web copy, as well as a thermometer graphic. And, finally, we made the most of our last appeal. Donors are more likely than ever to give towards the end of a series (it’s a trend we’ve seen across clients), so our December 31st appeal featured the full treatment: a note above the email wrapper, ‘thank you’s’ to all prior $100+ donors and just a hint of guilt-inducing language. Testing has consistently shown how much of a difference even subtle changes on donation pages can make. We took that to heart in two crucial ways. First, we helped Oxfam conceive and script a short, powerful online video. Oxfam staff produced it in-house with basic editing software, and we included it in every appeal and donation page. It used moving text, simple animation and compelling music to make our case for giving. Previous Oxfam videos had been informative, but not emotional – more suitable for a board meeting than a full-list appeal. This one lived up to M+R’s basic rule for online video: make me laugh, make me cry, or go home. Additionally, Oxfam worked with Convio to produce an API-based donation form for all donation pages. This work transformed the default Convio donation forms into cleaner, more appealing forms. Collectively, the work on the appeals and the landing pages netted a 49% increase over 2007 in total giving in response to appeals, despite a significant decrease in average gifts, which we attribute to economic factors. In our November meeting, we developed an in-depth plan to maximize every single visit to www.OxfamAmerica.org. For the first time ever, a ‘lightbox’ would pop up above the homepage with an end-of-year giving promotion during the month of December. The lightbox featured strong text, the thermometer graphic and some radio button teasers where donors chose their desired contribution amount before clicking “submit” and landing on the full donation page. Cookies ensured that each user would only see this once (until December 31st, when it was up for all users, all day). 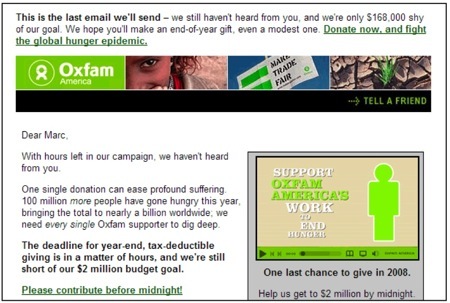 With the lightbox, we now had four distinct homepage spaces in which to promote two campaigns: end-of- year giving and Oxfam America Unwrapped. We laid out a plan to rotate promotions strategically, highlighting Unwrapped during peak gift-giving weeks and keeping content fresh. On December 31st, we updated all text to include “donate by midnight” language. The result? Passive giving to end- of-year campaign pages topped $450,000, plus $1.4 million in passive giving to the main donate page during this period. That was 2,200 more donations than last year, which made up for a decline in average gift. There’s no way we could have achieved this without our aggressive promotion strategy. With no end to the recession in sight, your organization will likely have a “November moment” if it hasn’t already. But it helps to be prepared. First, get your colleagues thinking creatively NOW about how to change your pitch during annual campaigns. Your organization is wonderful and valuable, but that’s not enough anymore. Why is it important to give right now, at this very second? What will make your donors forget about their 401k’s for a moment? Second, stop making excuses and make an online video. It doesn’t have to be fancy. Oxfam’s didn’t even require a camera! But if it’s emotionally resonant, it will increase returns and be well worth the investment. Third, build a lightbox or splash page that’s ready to roll out when a media hit or emergency drives a spike in website traffic. Making the most of those moments is critical to staying strong in a weak economy. As a last resort, consider replacing one or two non-fundraising messages with fundraising appeals. Adding messages is not a sustainable strategy, and you should monitor unsubscribe rates carefully, but if your campaign is resonating don’t be afraid to get while the getting’s good. Meeting your budget in this economic climate may take a bit more effort, but the efforts pay off – so don’t go down without a fight! If you have questions or would like to discuss your organization’s online fundraising strategy, please don’t hesitate to get in touch with us.